The clergy, the rich, the government, they all can drink his blood, but the people who buy newspapers just to see his newest drawing, adore him. Albert Hahn, a young Dutch artist, suffering from consumption, is one of the outstanding political cartoonists of the 20th century. In his short life (1877-1918) Hahn draws about 4,000 cartoons and many of them are still worth looking at. He was deeply moved by the enormous poverty around him. In his drawings he attacked those he held responsible for this misery: factory owners, the church, large landowners, rack-renters, slumlords, politicians. Hahn believed that the international labour movement eventually would bring peace and prosperity on earth. When the Great War broke out, in 1914, it came to him as an enormous dissapointment. According to his friends Hahn nevertheless stayed a cheerful socialist, with a firm believe in the final victory. But his drawings tell a different story. In the war Hahn takes no side, although he aims more often at German warlords than at their allied counterparts. The German Kaiser Wilhelm II is one of the villains whom he draws frequently. But more often Hahn tries to draw a general view, with more attention for the human suffering than for the identity of the culprit. For Hahn the essence of war is not the battle between the countries. He charges against war itself, the destruction and the killing — and he draws it as a direct consequence of the greedy economic system: War is the true face of capitalism. 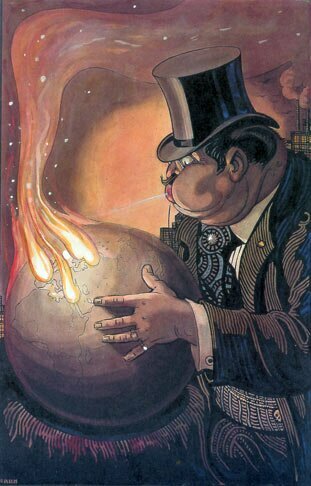 See the picture on the right: World On Fire (1915). His cartoons were used and published all over the world - in almost all belligerent countries (although most countries were rather selective in which drawings they choose to print). In his own country the goverment did not like his outspoken war drawings because they jeopardized the unsteady neutralism of the Netherlands. Germany several times protested against the way Hahn depicted the Kaiser. Hahn was born in the city of Groningen, in the north of the Netherlands. As a child he contracted tuberculosis and he was ill most of his life. He died during a tuberculosis attack on 3 August 1918. He was 41 years old. On this very same day his favorite weekly De Notekraker (the nutcracker) published his last cartoon. After four years of war - militarism speaks: "Have trust in me. I do not work fast, but the peace I will bring eventually will be very complete." 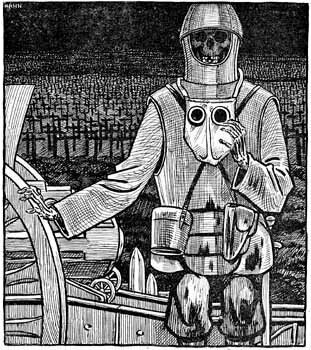 Click here for a show of Hahn's war cartoons.